Jon Bergmann and Errol Smith participated at the Kickoff Meeting in Wiener Neustadt and impacted with their knowledge and enormous experience. 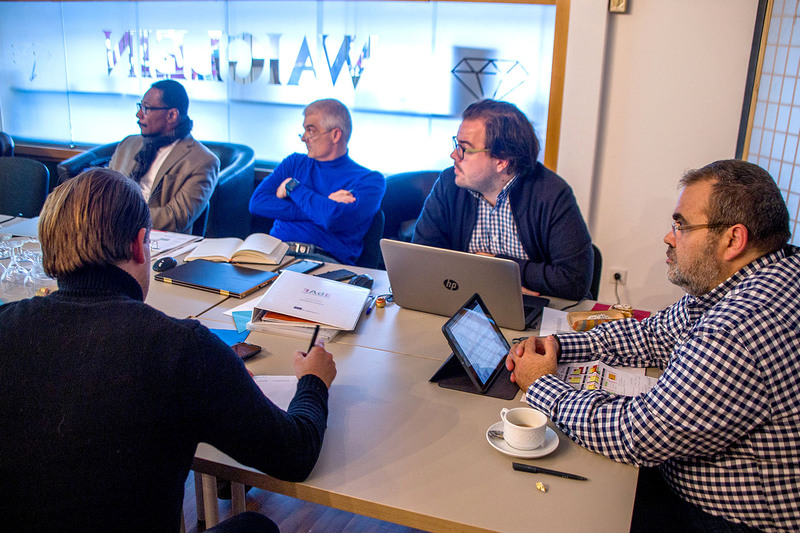 At the Kickoff Meeting in Wiener Neustadt (November 16 and 17, 2019), organized and moderated by Peter Mazohl, people from all partners have taken part. The consortium of the FAdE-in project consists of four regular partners (European Initiative for Education EBI/EIE AT, EDRASE GR, Asociación Juvance ES, and Intermezzo Ungdom NOR) and the Flipped Learning Global Initiative FLGI, USA, as an external partner (not funded by the EC but contracted as an individual partner by the EBI/EIE Austria). As special guests Jon Bergmann and Errol Smith have come from the USA to give their impact to the project. In these two busy and laborious days the concepts of the project were discussed, the working plan finalized and agreed, several organisational issues disculles and cleared, and finally the milestones and next steps in the project fixed. Due to the impact of the American partners the project is at the current level of the Flipped Learning method. As a special impact Jon Bergmann presented the 187 elements of Flipped Learning – a complete innovation, presented first two days before the meeting (in Istanbul).